A couple of years ago, in a grisly incident, witnessed by scores and captured live on many cameras, a 200-kg tiger mauled and killed a youth after he fell into the animal's moat in the Delhi Zoo…… that gory incident went viral on social media, also raising the Q on why people who were keen on filming the incident did not respond in any manner trying to help the victim. The man in his 20s reportedly had either fell off or had jumped into the moat which separated the tiger’s enclosure from the visitor’s gallery. The victim reportedly had history of mental illness. The majestic six-foot, seven-year-old tiger [a white Tiger], named Vijay, which was some distance away, saw the man in the concrete moat, that was covered with dry leaves, and bounded up to him. Footage showed the tiger glowering face-to-face at the man, as it initially appeared to be surprised on seeing the sudden human intrusion into its habitat. Heard of Rewa - a city in the north-eastern part Madhya Pradesh. It is the former capital of the princely state of Rewa and the former state of Vindhya Pradesh. The city lies about 420 kilometres (261 mi) northeast of the state capital Bhopal and 130 kilometres (81 mi) south of the city of Allahabad. Rewa derives its name from another name for the Narmada River. Rewa, not to be confused with the electric car Reva, is associated with white tiger – for it is here that the first of the white tigers was captured, a cub of 2 year old by Maharajah Martand Singh of Rewa. The tiger lived in captivity at the Maharajah's summer palace for five years and, on its death, was stuffed and sent as a gift to King George V as a sign of India's loyalty to the crown. Though it was legal and hunting was considered a valour, in 1951, reportedly a tigress had been sighted with 4 cubs – the bigger was one was shot at and the cubs including a white one named Mohan lived its life in captivity. The white Bengal tigers are distinctive due to the color of their fur. The white fur caused by a lack of the pigment pheomelanin, which is found in Bengal tigers with orange color fur. When compared to Bengal tigers, the white Bengal tigers tend to grow faster and heavier than the orange Bengal tiger. They also tend to be somewhat bigger at birth, and as fully grown adults. White Bengal tigers are fully grown when they are 2–3 years of age. White male tigers reach weights of 200 to 230 kilograms and can grow up to 3 meters in length. It may look majestic and found in many Zoos, but in contrast to what some believe, the White Tiger is neither a subspecies in its own right, nor an albino form of a ‘normal’ tiger. It simply is a rare form of Bengal Tiger that possesses a specific gene, giving it a lighter appearance. The scientific name of the White Tiger is Pantheratigris, since it is merely a different coloured version of the Bengal subspecies. According to many experts, its breeding programme is harmful and only results in weaker generations. Here is a report that appeared in TOI and Indian Express of date. Politicians and white tigers share space on hoardings put up across Rewa in Madhya Pradesh amid preparations for the opening of the world's first tiger sanctuary . Thousands of locals arrived in a state where the large hoardings of ministers posing with a white tiger are dotting Rewa town. Thousands of local people gathered on Sunday to witness the opening of the world's first white tiger sanctuary , making it appear more like an election rally as people swarmed around shouting slogans just outside the sanctuary near Rewa. The white tiger has been an election issue for years now say locals. Only one white tiger, Vindhya is currently in the sanctuary at Mukundpur, about 20km from Rewa.There are two other white tiger in enclosures in the zoo adjoining the safari. The first white tiger of Rewa, Mohan was raised in captivity. Mohan's cubs were thereafter distributed in Indian Zoos and Zoos abroad. They were reportedly inbred to create a white tiger progeny later. But they disappeared completely from Rewa in 1976. It has been a political issue since because people associate it with local heritage and believe tourism generated from their return can be a turnaround for a parched area reeling under severe water stress. Rewa has been seeing a large number of people moving out in search of livelihood as agriculture is difficult. Ironically , wildlife experts have been very critical of white tiger breeding and believe it's a waste of money since they have no conservation value. You need not go Rewa to see one ! Our own Vandalur Zoo in Chennai has some. 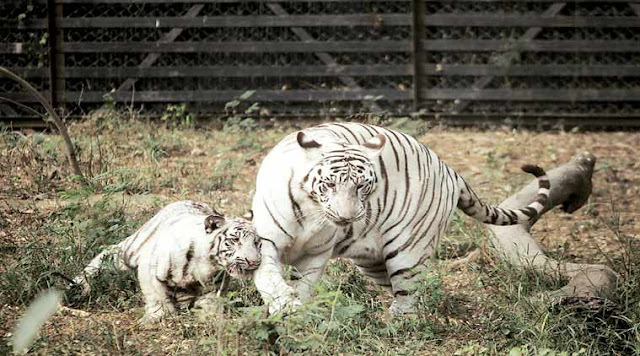 In Dec 2014, TN CM Ms J Jayalalithaanamed two male white tiger cubs Devaa and Nakulaa and two female cubs as Kalaa and Maalaa.The cubs were born to a white tigress, Namrutha, at the Arignar Anna Zoological Park at Vandalur in neighbouringKancheepuram district, an official release said. In Jan 2o16, the Delhi Tiger Vijay sired 5 cubs through Kalpana, another tigress.